I'm going with Tampa Bay Saltwater rock and sand. 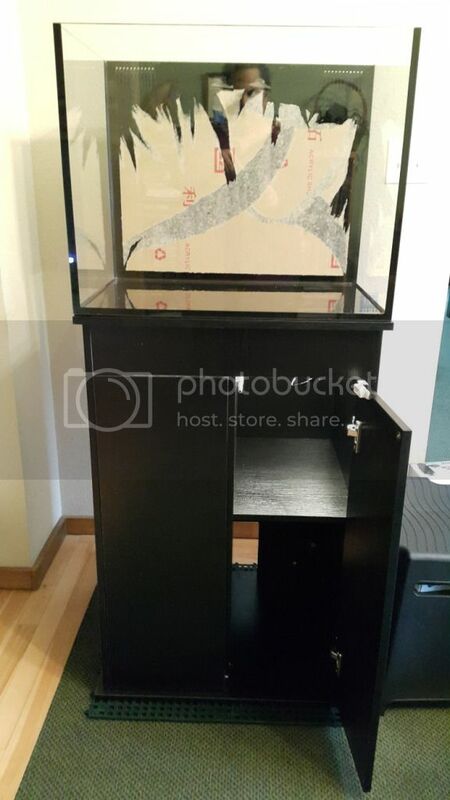 Hoping to get that in next week and finally get this tank wet! I've been chipping away at it all day but it's a real pain. I still need to tidy up that cord inside but I wanted to wait until I had more plugged in before messing with cable management. Assuming I can get the rest of that paper off today there may be more setup pictures coming later! Your supposed to leave that on!!!!!!!!!!!!!!!!!!!!!!! Try hot water. I tried hot and cold water both. Magic eraser too. None of that managed to make much of a dent but a plastic algae scrubber has worked pretty well. Only a couple of small spots yet that I'm going to take care of tomorrow. Finally conquered the evil brown paper and got some of the equipment hooked up. Tomorrow's task: figure out how to use my RO/DI! Looking forward to following your build. Good luck! I wrestled between using live rock and dry for a couple of weeks. Lots of pros and cons to both. In the end it just made more sense to me that having all the parts of the ecosystem would be a better way to start. People spend so much time culturing this and dosing that to get microfauna to grow in our tanks and this just seemed like an easier way to kick it all off. Plus it's kind of exciting to me that I don't know what I'll find in there! 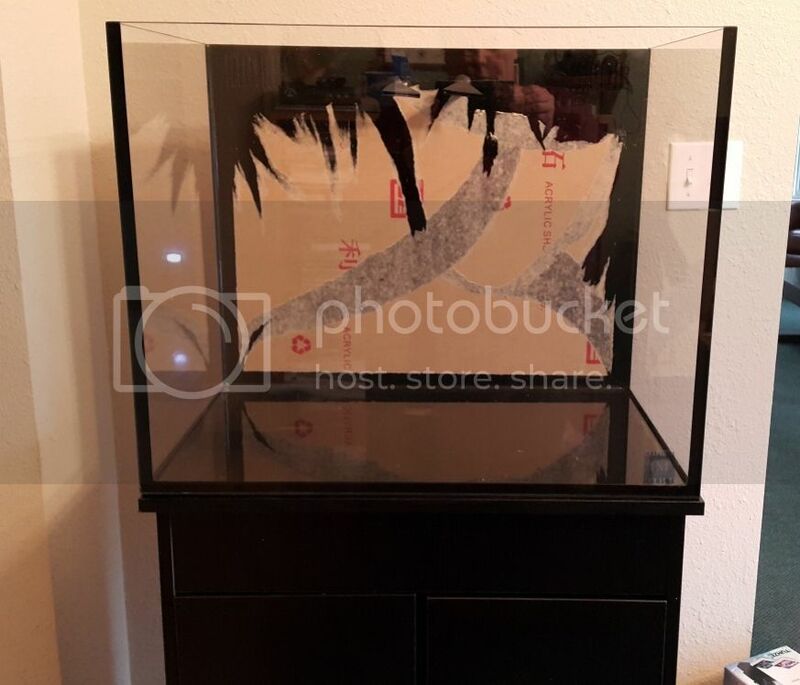 I ordered the 30 gallon package (based on the measurements of the display area and a volume calculator it came up just over 30g) which comes with 30lbs sand and 60lbs rock. 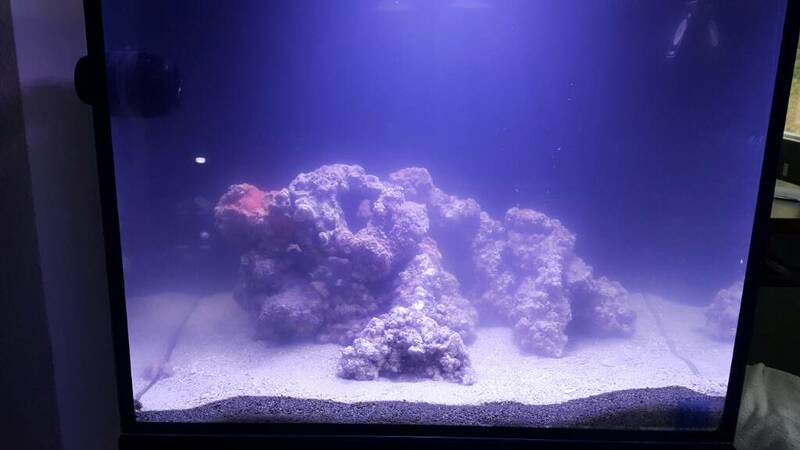 I think that's probably too much rock but it gives me some flexibility with my aquascape and I can always throw some of the extra in the sump until I get my fuge going. Getting my first delivery tomorrow so there should be some exciting pictures then! The seal between the front and back on mine seems solid. For my leak test I filled only the display not quite up to the overflows and ended up with no water in the sump at all. Looking forward to finally getting this tank wet. I've been making RO water all day and will do my first saltwater mix tonight. Exciting times! First mix of salt water was 1.026 right on the nose. Completely by accident because I was guessing at the volume in the container since it wasn't full. I went in after and made a mark so I know for next time how high to fill it and how much salt to add. I'm having some trouble bringing it up to temperature (hovering around 68) but I think that's because the heater is only a 50W and it's pretty chilly out in the garage. I think the water in the boxes will probably be low too so I'll bring it all up together gently in the tank and that should be fine. Hopefully any critters that are hitchhiking are hardy! He's less than an inch across. Haven't seen the goby yet this morning but I figure he's hiding after yesterday's trauma. Moved a few rocks around. Not sure if I'm happy with it yet. Woke up this morning to the sound of falling water. Not as bad as it sounds, only a minor catastrophe. I made the mistake of setting up my ATO right before bed and trusting it to work right. Somehow I guess it was running backwards? Woke up to my return pump running dry and water overflowing in my ATO container. Half asleep and mildly panicking I somehow managed to fix it with the help of my husband. Still not sure what happened. My salinity is a little low now 1.024 but I figure that's okay because now there's some salt in my ATO container. Still no detectable ammonia but I did find my little urchin dead this morning. Don't know what it was that did him in. Are you testing for nitrite/nitrates? With all that live rock, you may have enough nitrifying bacteria and it is converting all the ammonia already. Yet, only after only a few days, I doubt there would be enough ammonia anyway. I haven't tested for those yet. I was waiting to see some ammonia first. You could be right though, maybe it's already converting fast enough that I don't see any. Next time I test the water I'll do all three. All the other inhabitants seem okay despite this morning's adventure. I even saw some barnacles sweeping and a couple of filter feeding worms set up shop in the sand. With a small tank load like that, it may also take some time to see nitrates increase as well. Goby was dead this morning. Salinity and temperature were a bit wonky yesterday, so I'm thinking that along with the stress of shipment is to blame. Other inhabitants are still looking okay. Ammonia, nitrite, and nitrate are all still undetectable. Looking clearer finally today! Most of the bubbles are gone. Rearranged to make a cool cave in the left front and make a sandy spot in the right front for my eventual hammer garden. I was also making room for the rest of the rock. Hmm... two dead critters soo soon. Something doesn't seem right. Even though I current am not/haven't tried this, (just put up a 20g with a goby and shrimp pair). Have you just thought about doing a fish less cycle. It'd be nice to see your numbers go through the gambit. Did you buy fish online or local? Both of the deceased were hitchhikers that came with my rock and sand from Tampa Bay Saltwater, not animals I added to cycle. I'm fairly sure cycling didn't kill them since I've been testing twice a day and have yet to see anything show up for ammonia, nitrite or nitrate. The temperature and salinity changed very quickly yesterday due to the problem with my ATO which I think is what killed them. TBS ship in water? How did a Goby become a hitchhiker? That is slightly confusing. If my wife did not fall in love with the shrimp and Goby pair at the LFS, I would have went fish-less cycle too. Now that you have no living critters, it would be a strong consideration just to see the numbers cycle. Yes, they ship in water. He was buried in the live sand along with the urchin. When I poured it out into my tank he came shooting out of it. He was a cute little guy and I'm sorry he died but he wasn't planned. Well, I do still have living critters in there. LOTS of hitchhikers in TBS rock. Barnacles and worms and some kind of bivalve adhered to the rock. I did see a nudibranch at one point but I'm not sure if it's still alive. The same salinity/temperature swing might have done him in. At least one crab and two pistol shrimp hiding out somewhere. I'm going to put in a trap tonight and see what I catch. Interesting story. Thanks for sharing! I just got a better look at the crab I have been trying to catch after moving some rock around. I think he's a red mithrax. Score! He is teeny, maybe a little bigger than a dime, and pretty adorable. Not sure I can get a picture as he mostly hides in a crevice in the rock which is why I couldn't tell what he was.